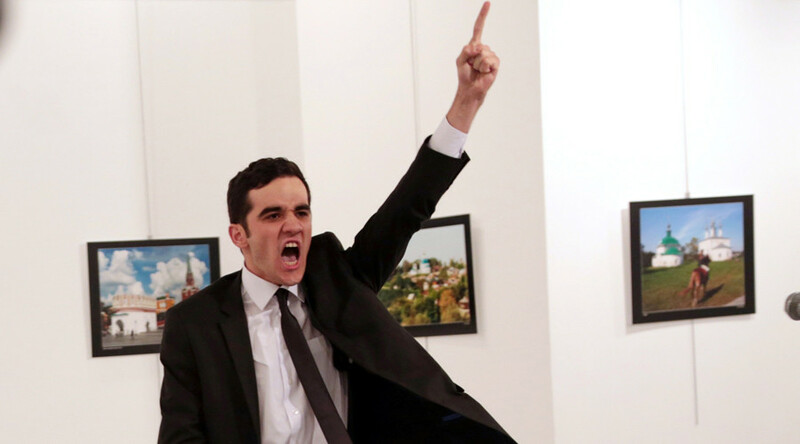 The image showing the assassin, Mevlüt Mert Altıntaş, standing and shouting by the body of the killed Russian ambassador to Turkey, Andrey Karlov, was captured by AP photographer Burhan Ozbilici. The picture received the photo of the year award from the World Press Photo Foundation, an independent group based in Amsterdam, the Netherlands, on Monday. Having that particular picture “as a sort of flagship photograph of the year for World Press Photo” was “a terrible idea,” jury chair Stuart Franklin told RT. Franklin himself did not vote for the image. “It made no sense at all. It crossed the moral and ethical boundaries that I’d calculated. In the world of journalism we always have to sort of balance issues like censorship or not showing the truth or what’s going on with deeper moral concerns about what we are actually showing or talking about,” Franklin said. According to Franklin, it was “morally completely wrong to have a photograph that seems to advance the intentions of a terrorist who was in front of the press at a press conference assassinating an ambassador. The controversial photo sparked heated discussions across social media platforms, with some saying that it is totally immoral to judge an image of a murder as photo of the year. @WorldPressPhoto@AP@BurhanOzbilici This is sick and highly immoral! @AP So we are simply going to glorify cold-blooded murders now? I see we have all lost our sense of decency. Some people’s thoughts turned to how Andrey Karlov’s family may have reacted to the news of the award. @WorldPressPhoto@AP@BurhanOzbilici Difficult for the family of the victim, unless they have consented of course. Or how people would react if the victim were a member of their family. @WorldPressPhoto Imagine the killed man is a member of your family! What is wrong with you people? Very sad. The award would be a boost for terrorists, commenters said. @drwhatt@AP By attaching a reward, Jihadist's will see that as a win justifying their cause. It's stupid people don't understand that. Some perceived the results of the photo contest as a type of provocation. @AP DISGUSTING propaganda! Anti-civilizational, pro-terrorism and last but not least, obviously anti-Russian. SHAME ON YOU! @WorldPressPhoto@500px@AP@BurhanOzbilici An incredibly well deserved win. such an iconic image from such a horrific situation. @WorldPressPhoto@AP@BurhanOzbilici : This photo is an incredible Historic document. Some people admitted that the photo was indeed powerful, but that it shouldn’t have received an award. @drwhatt@AP I understand that & I respect him, But this photo should not have any reward attached to it.